The bowie knife might have been a purely American-made knife, but that does not mean that it did not spread to the rest of the world. This 1880 Bowie Knife is actually modeled after an English-produced bowie knife that was made for the U.S. trade. The original of this knife was produced almost 50 years after the knife was first designed, and although some things are different, much about this bowie knife still hails back to the first. This modern recreation of a classic bowie knife features the same clipped point blade, although on this knife, the clipped point is a bit shallower, although this does not hurt the weight or the balance of the blade at all. The blade is crafted from hand forged tempered high carbon steel, which comes with a factory edge that can be honed and worked on, as the blade holds an edge remarkably well. Unlike most classic bowie knives, though, this knife features a thinner handle, to allow for a more discreet blade. The grip consists of polished, dark hardwood scales that are married to the blades full tang, which gives the knife a great deal of strength and durability. Included with the knife is a leather scabbard that features a steel chape. The blade of this knife measures approximately 10 inches long, while the knifes overall length is closer to 15.125 inches. 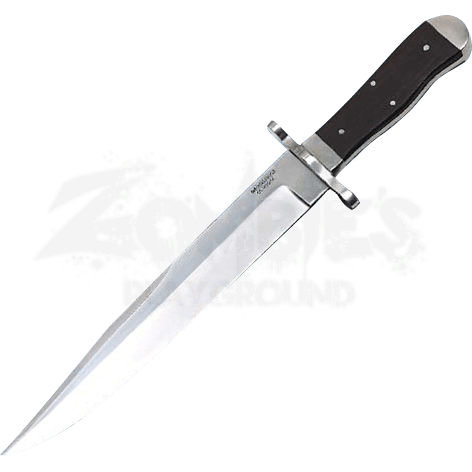 If you are looking for a rugged and rough knife that echoes the design of a classic bowie knife out of history, then you have found what you are looking for in this 1880 Bowie Knife.